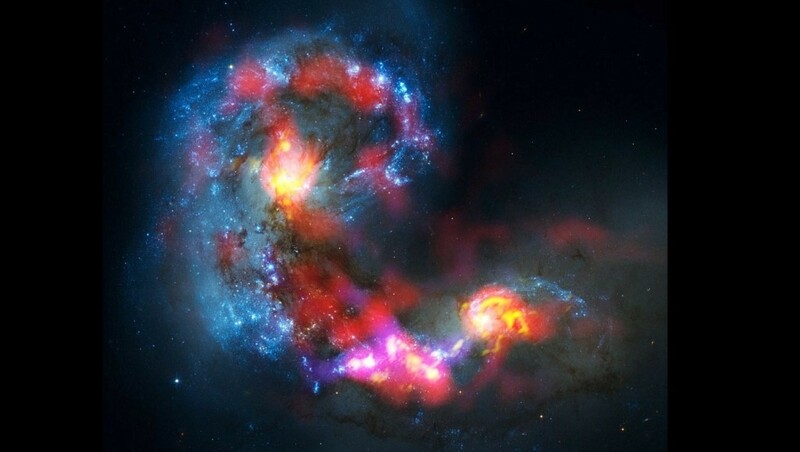 Below is the optical image of the “Antennae Galaxies” colliding, as taken by the Hubble Space Telescope. Overlaid below is a radio-image taken by ALMA. 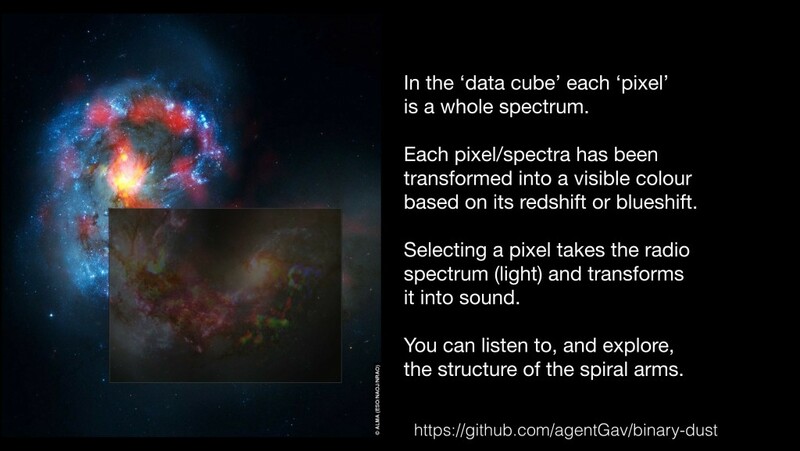 In the ‘image’ in this case, each pixel is actually represents a spectrum of frequencies across the electromagnetic radio spectrum: the ‘image’ is actually a data-cube. We have transformed this data-cube in two ways. Firstly, so you can see it on the overlay, we’ve transformed the radio frequencies into visible colours, so you can see a slice of the cube. Secondly, we’ve transformed the e-m spectrum into an acoustic spectrum. Remember light≠sound: what we are doing is translating the frequency of e-m radiation (‘light’) into a frequency of pressure wave (sound). Below is the data cube on its own in a playable format: to view & listen, wait a moment (20-30 seconds) while the player below loads. NB: works best on Chrome or Firefox, not IE or Safari. Note: this loads a 8MB data-cube before displaying … it could take between 20 seconds to several minutes to appear if you are on a slow connection: but note it did take these photons 70 million years to reach us, so please be patient while they go the last few bit-miles!